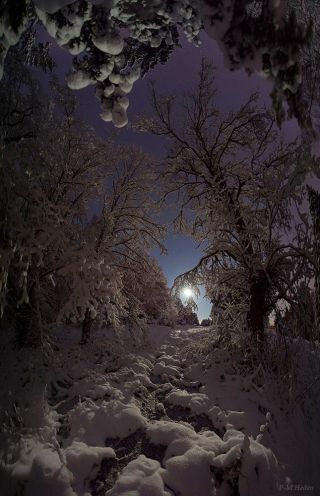 The moon shines over a snowy woodland near Stockholm, Sweden in this image taken by astrophotographer P-M Hedén of The World at Night in December 2012. A serene snowy woodland is illuminated by a glowing moon in this night sky photo. Veteran astrophotographer P-M Hedén of The World at Night took this beautiful photo near Stockholm, Sweden in December 2012. The moon will become full in late December, when it is often called the "oak moon." Other names are frost moon, winter moon, long night's moon, and moon before Yule. During the full moon, the orb rises around sunset and sets around sunrise without spending very much time in the daytime sky. Editor's note: If you have an amazing skywatching photo you'd like to share for a possible story or image gallery, please send it to spacephotos@space.com.